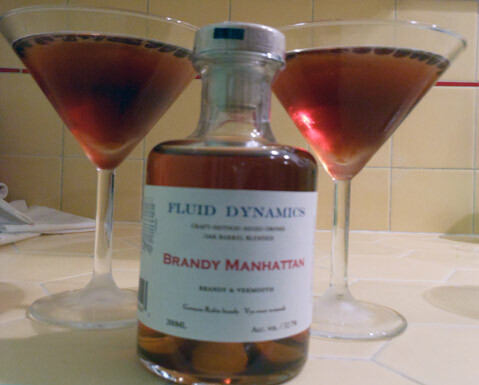 After tasting Fluid Dynamics’ barrel-aged cocktails, I’ve decided that I’m not old anymore — I’m just aged. Alas, I didn’t spend six weeks in an oak barrel after being made from some of the U.S.’s finest craft liquors — for instance, the Saratoga cocktail is Germain Robin brandy, Low Gap whiskey (it’s clear! — aka high-class hootch), and Vya vermouth. The aging isn’t just a gimmick, either: It adds depth, creating roundness where sharp alcohol corners might otherwise lurk. You can order a 200 ml bottle (two drinks) for $20, which is the least something this swank would cost you out. Or work on aging your own drinks at home (Negronis are supposedly delish, as the Campari mellows) by buying a one- to three-gallon barrel (search the Internet, and you’ll find many sources), mixing things up by the big batch, and being properly patient. For info, see craftdistillers.com; to buy, see caddellwilliams.com.